The South Dakota Wheat Commission was established pursuant to the enabling legislation known as the South Dakota Wheat Resources Act passed in 1961. The Act declared it to be the public policy of the state of South Dakota to protect and foster the health, prosperity and general welfare of its people by protecting and stabilizing the wheat industry and the economy of the areas producing wheat. 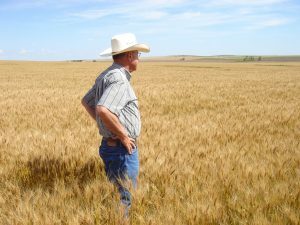 South Dakota Wheat Commission meets the objectives of this policy through its Mission Statement: To stabilize and improve the South Dakota wheat industry through research, market development and education. Within this site you will find a wealth of information (details as to where check-off dollars are spent, educational materials that people are encouraged to use to their benefit, etc.) as the Commission pursues its mission of research, market development and promotion. An annual report to describe the activities and financial conditions of the South Dakota Wheat Commission for the prior year. Meeting the objectives of stabilization and profitability of the South Dakota wheat industry through research, market development and promotion. Keeping you informed about what is happening in research, market development and promotion in the industry. Commissioners are appointed by the Governor based upon nominations from wheat producers. A term is three years in length, and no Commissioner shall serve more than four consecutive terms (38-10-7). Two of the five members of the wheat commission shall be residents of and having farming operations in that area of the State of South Dakota west of the Missouri River; two of the members shall be residents of and having farming operations in that area of the State of South Dakota east of the Missouri River; and one member shall be selected as a member at large from the State of South Dakota (38-10-6). The South Dakota Wheat Commission meets at least once every three months, and at such other times as called by the chairman or by any two members of the commission (38-10-11). All meetings follow the South Dakota’s Open Meeting laws, with notice being displayed online at State of SD Boards and Commissions website, the SD Wheat Commission website and at the SD Wheat Commission office located at 116 No. Euclid, Pierre, SD.